Determine if you have any extra money you can pledge each month toward your debt repayment plan. The more money you can pledge the faster you'll get out of debt. Pledge Money is the extra amount of money (if any) you can afford to apply toward your debt repayment plan each and every month. 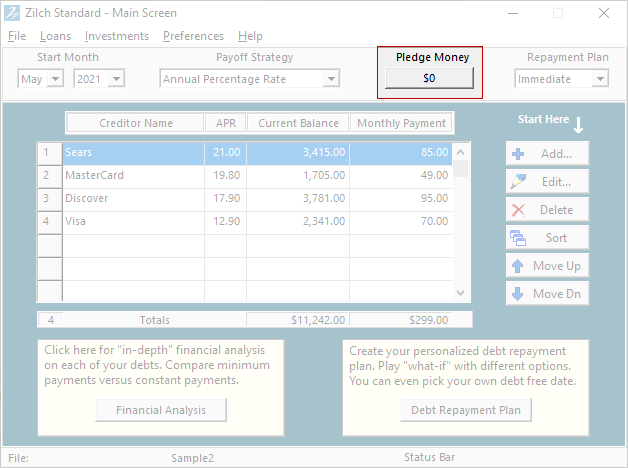 The more Pledge Money you can use, the faster you will get out of debt and the more money you will save. While adding Pledge Money can make a difference, it is not necessary for you to have any extra money to make this program work for you. We believe you need to watch out for what we call "Debt Sharks". These are companies that prey upon people in debt because they know how vulnerable debt-ridden people can be.